Fatigue is a topic which causes much discussion amongst seafarers and the shipping industry. Ask how crews feel about it on social media and there will be many comments explaining exactly how it is. When seafarers talk to ISWAN about fatigue, there is a definite pattern to the responses. They talk of how the stresses, strains, rhythm and patterns of life and workload at sea all take their toll. They talk about irregular hours, paperwork, demands of their job and the fact that sleep can often be broken and fitful. Yes, mention the word fatigue and a very worrying pattern emerges. Fatigue is not some vague concept to be confused with feeling a bit tired. It is a recognised and serious medical concern, and while it can go by different names the effects are often the same, and they are serious and debilitating. The problem can be called tiredness, exhaustion, lethargy and listlessness. What remains clear is that these all relate to the physical and/or mental state of being tired and weak. Fatigue is a serious problem, and despite changes to working time directives and conventions such as the International Convention on Standards of Training, Certification and Watchkeeping for Seafarers (STCW) and the Maritime Labour Convention (MLC), there is no sign of the issue going away. The fact, as we have seen in comments on our SeafarerHelp Facebook page, remains a very real one. The problem needs to be given the respect it deserves and the cause underlying the symptoms needs to be addressed. The possible causes of fatigue are virtually endless. It seems that tiredness is a potent way for the body and mind to try to get the message that something is wrong through to even the most stubborn or determined person. Seafarers will often try to work through the demands of life at sea; they are stoic, determined and results-focused. That can bring its own problems. People experiencing stress and demanding physical or mental work and those without sufficient rest will become fatigued. Shipping companies and seafarers must find the route to balancing work, rest and recreation. Fatigue is a symptom, a sign that something is going on which is damaging the physical and mental wellbeing of the sufferer. At sea, this is likely to be overwork and lack of sleep, and is often worsened by loneliness, isolation and perhaps even depression. Sleep problems: Shift patterns at sea can cause problems sleeping – even the normal 4 on, 8 off. However, this can be heightened dramatically if work demands increase. The 6 on, 6 off is particularly hard for people to cope with. Throw cargo watches, port calls or mooring stations into the mix and sleep patterns can become extremely confused and messed up. There can also be weather issues – if a ship is bouncing around, this can make it hard to sleep. Life at sea can be exhausting. Mental health: Some stress can be good, but when it passes over a tipping point and stress levels become excessive, they can easily cause fatigue. Stress and worry are two emotions that commonly cause tiredness. Stress can mean people are unable to see the light at the end of the tunnel, which leads them towards despair. Despair is draining and will eventually cause fatigue if it is present for long enough. Not being in control over a situation can be frustrating, annoying and very tiring. Being away from home, working hard, having to deal with difficult situations, the dangers of the sea and of potential uncertainty over when seafarers may get home – all these can cause fatigue. Disease and Illness: There are many medical reasons that seafarers may become fatigued. With an ageing work force and with concerns over health at sea, there can be issues such as kidney and liver disease, electrolyte problems, diabetes, hypothyroidism and anaemia. All can play a role, so seafarers need to know about their health and the impact of their lifestyle on it. Diet Onboard: The effect of diet on the body can have massive implications for fatigue. Health and wellbeing rest on a good, healthy diet so it is important that meals are healthy and nutritious and contain the vitamins and minerals that are needed. Another problem at sea can be consumption of too many caffeinated drinks. Tea and coffee are extremely important parts of life at sea – and since the demise of smoking and alcohol, having a hot drink is an important relaxation ritual for many at sea. However, these may make it harder to get to sleep, or stay asleep, especially if consumed close to bedtime. Often there is also the lure of energy drinks, and a couple of cans may give seafarers wings, but they don’t add to a good rest. Just last month, the 5th Sub-Committee on Human Element, Training and Watchkeeping (HTW 5) agreed on a draft set of revised International Maritime Organization (IMO) Guidelines on Fatigue. These Guidelines aim to help all stakeholders mitigate and manage fatigue, and will be submitted to the Maritime Safety Committee (MSC 100) for approval in December 2018. Many industry bodies and much research have long warned about fatigue. One of ISWAN’s partners, the UK Confidential Hazardous Incident Reporting Programme (CHIRP), has stressed how difficult it is to address seafarer fatigue. They believe that safe manning should take into account the minimisation of fatigue but they constantly see malpractice; therefore, at times of high work load due to operational requirements, this number is not sufficient to manage the risks associated with fatigue in seafarers. So, it is vital that fatigue is addressed – that the symptoms are understood and the root causes addressed. It is not enough to think of this as simply a ‘sleep’ issue, there is more to consider. Tackling or managing fatigue means looking at all the issues, such as work, contact with home, shore leave, diet, exercise…as well as rest. The latest self-help guide in ISWAN’s series of Good Mental Health Guides includes information and tips for seafarers on how to manage fatigue and get the most from their sleep on board. 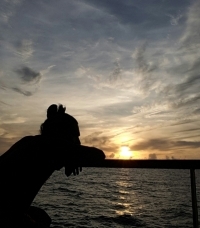 Managing Stress and Sleeping Well at Sea can be downloaded here. An audio relaxation exercise can also be streamed or downloaded here.